FRISCO, Texas (June 29, 2018) — US Youth Soccer is proud to announce the 14 champions of the 2018 US Youth Soccer Far West Regional Championships and commend their success in the state and regional championships of the US Youth Soccer National Championship Series, the country's most prestigious national youth soccer tournament. 13U Boys CDA Slammers FC HB05 Elite Huntington Beach, Calif.
13U Girls San Diego Surf 05 Academy Select San Diego, Calif.
14U Boys ECFC Salinas United 04 Salinas, Calif.
14U Girls Arsenal FC Ontario, Calif.
15U Boys Total Futbol Academy Los Angeles, Calif.
15U Girls Beach FC Long Beach, Calif.
16U Boys Tuzos Academy 02 Phoenix, Ariz.
17U Boys Santa Barbara Soccer Club Santa Barbara, Calif.
17U Girls Rebels 2001 Elite San Diego, Calif.
18U Boys Downtown LVSC 00 Academy Las Vegas, Nev.
18U Girls CDA Slammers FC HB 00 Elite Huntington Beach, Calif.
19U Boys FC Golden State White Pomona, Calif.
Cal South led the way with nine Far West Regional Champions, while Utah had two winners. Cal North, Nevada and Arizona each had one champion. After six teams entered the tournament looking to defend their regional titles, only 16U Boys Tuzos Academy 02 (AZ) managed to win a back-to-back regional title. The Far West Regional Champions have earned the opportunity to advance to the third and final stage of their quest for the National Championship. The teams will join the 40 National League qualifiers and the champions from the Eastern Regional Championships, Midwest Regional Championships and Southern Regional Championships for the National Championships in Frisco, Texas. The US Youth Soccer National Championship Series is the country's most prestigious national youth soccer tournament, providing approximately 185,000 players on more than 10,000 teams from US Youth Soccer's 55 State Associations the opportunity to showcase their soccer skills against the best competition in the nation while emphasizing teamwork, discipline and fair play. 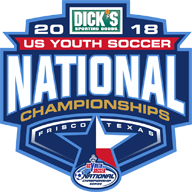 The National Championships cap a yearlong series of competitions, US Youth Soccer National Championship Series, for boys and girls teams in multiple age groups as teams earn their way from the top teams in their state to the regional championship tournaments. US Youth Soccer State Champions, US Youth Soccer Regional League winners and selected wildcard teams are eligible to compete in one of four US Youth Soccer Regional Championships. The champions in the 13U through 19U age groups from each regional event will converge in the finals in Frisco, Texas.